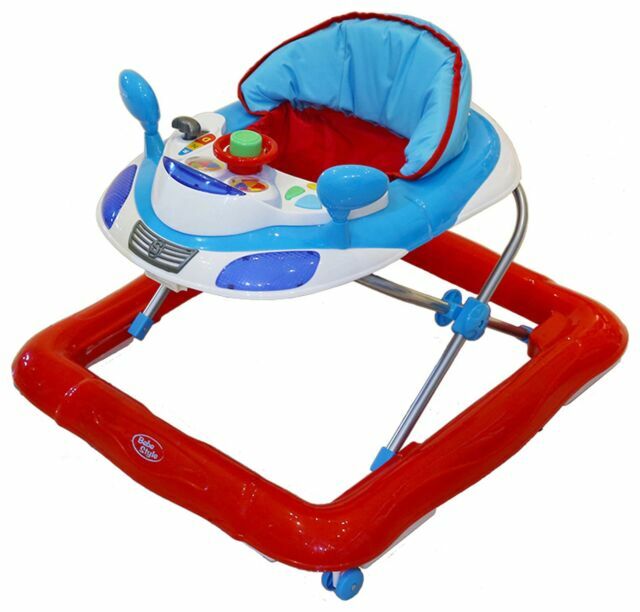 This brightly coloured and fun baby activity walker encourages your baby to learn whilst playing. Electronic toys, and multi height positioning, makes this walker a perfect choice. Baby walker features:Can be adjusted in height to suit the build of different children and ensure their feet touch the floor correctly, as recommended by paediatricians. Removable entertaining car electronic toy, with sounds, lights and manual activities. Adjustable seat and padded abdominal protection. Seat can be adjusted to 3-height positions. Safety pads to stop against falling down stairs. Back support for baby's comfort. 3 height positions. Size H42, W70, D64cm. Weight 4kg. Suitable for babies up to 12kg. For ages 6 months and over. EAN: 712321987945. WARNING(S):Only for domestic use. To be used under. Brilliant value for the money. My friends little boy loves this walker. I brought this bebe style dulex car for my grandson it's super lovely very nice gift for Xmas . Lovely nursery tunes music he loves it. Good product for its price.